President Emerita Dunn at the 2012 launch of the college's Women for the World campaign. Mary Maples Dunn—a historian and scholar who served from 1985 to 1995 as Smith College’s eighth president, during a period of rapid economic and demographic change—died Sunday, March 19. She was 85. Dunn was a champion for women—and for women’s history—both at Smith and in other leadership positions at Bryn Mawr College, Radcliffe College (later Radcliffe Institute) and Harvard University. In her decade as Smith’s president, Dunn led the college through exciting and challenging times. During her tenure, the college raised more than $300 million, constructed two major buildings and renovated many more, enhanced communication on and off campus, attracted record numbers of applicants (while holding the quality of those applicants steady) and doubled the value of its endowment. The curriculum became broader in scope, with five new majors and increased course offerings in non-Western and neglected American cultures. A celebration of the life of Mary Maples Dunn, Smith’s eighth president, will be held at 2 p.m. Sunday, May 28, in Helen Hills Hills Chapel. A reception will follow at the Conference Center. Dunn came to Smith after serving as a professor, dean and then academic deputy to the president at Bryn Mawr. After retiring from Smith in 1995, Dunn served for five years as director of the Schlesinger Library on the History of Women in America, then led Radcliffe during its 1999 integration with Harvard and the creation of the Radcliffe Institute. Dunn was a fellow at the Radcliffe Institute in 2000–2001, and then, in 2002 with her husband, Richard, became co-executive officer of the American Philosophical Society, a post they held until their retirement in 2007. Mary Maples Dunn served as Smith’s president from 1985 to 1995, a period of economic change and demographic shifts in the United States. Smith’s student body was increasingly diverse, and the college’s applications were strong. The college’s financial picture, however, was challenging: Dunn was charged with balancing the college’s budget and realigning institutional priorities and programs. She also advanced campus diversity and socially responsible investment during her presidency. 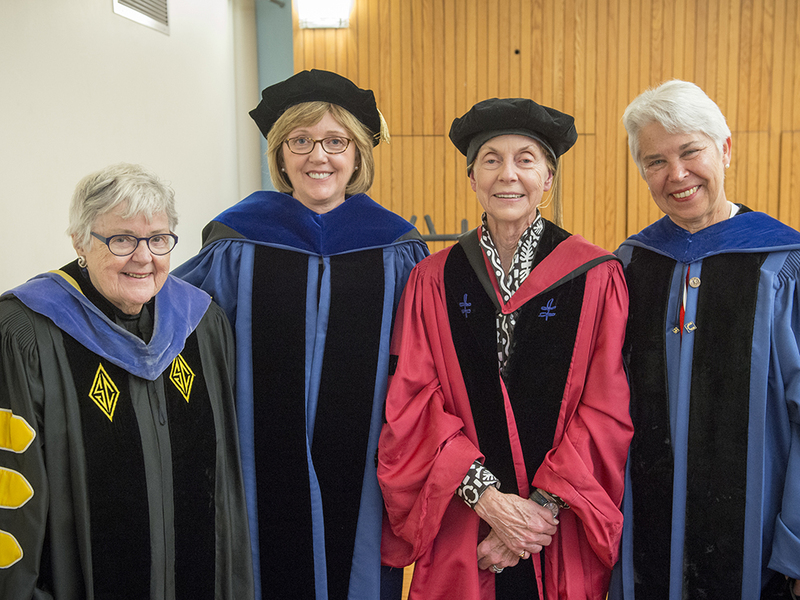 Throughout her tenure, even in the face of unexpected challenges, Dunn maintained a cheerful outlook and a sense of humor, building support from faculty, students, alumnae and trustees. Some of Dunn’s most well-known challenges at Smith were related to diversity. South African divestment was a national issue when she first arrived, and a few years later office space for student multicultural organizations became a focus of campus discussion. Her administration created programs, wrote position papers and adjusted college policies and structures in order to address questions of race and sexuality. The most extensive program, the 1988 Smith Design for Institutional Diversity, dealt primarily with race, but other endeavors handled questions related to sexuality, physical disabilities and derogatory language. The focus on budgetary accountability included two capital campaigns and a number of structural changes. Physical changes included the expansion of the Clark Science Center with the construction of Bass Hall and Young Science Library, and a number of renovations to residence houses. She also began the process of getting the college on what was then called the “Information Highway.” The Internet was first introduced to campus during her tenure, along with email and voicemail. And Horowitz noted that Dunn “never let the presidency interfere with her teaching.” Dunn and Horowitz co-taught twice a women’s history course during Horowitz’ first three years on campus. “She gave me a sense of how to teach at Smith, because she understood the student culture so well,” Horowitz noted. Daniel Horowitz, Smith’s Mary Huggins Gamble Professor Emeritus, noted that every college president has her own distinct style. “Mary was encompassing, breezy, direct and full of life,” he said. “She had a rare ability to create around her — in both small and large settings — a sense of excitement and camaraderie, a real feeling of loyalty.”Dunn came to Smith in 1985 after seven years as an administrator at Bryn Mawr. After she received her undergraduate degree from William & Mary in 1954, she earned M.A. and Ph.D. degrees in colonial U.S. history from Bryn Mawr. She began teaching at Bryn Mawr while she was completing her Ph.D., then moved through the academic and administrative hierarchy, becoming dean of the undergraduate college at Bryn Mawr in 1978, then academic deputy to the president in 1981. The recipient of an honorary degree from Smith in 1998, Dunn also earned honorary degrees from Amherst, Brown, Lafayette, Marietta, Haverford, Transylvania University and the University of Pennsylvania. Dunn—a resident of Cambridge, Mass., and Philadelphia—passed away peacefully while visiting family in Winston-Salem, N.C.
She is survived by her husband of 57 years, Richard Slator Dunn; daughter Rebecca Cofrin Dunn of Winston-Salem, N.C., her wife, Andrea Kurtz (a 1992 graduate of Smith), and granddaughter Cady B Marie Dunn; daughter Cecilia Dunn of Newton, Mass., her husband, Lee Campbell, and grandsons Benjamin Dunn Campbell and Frederic David Campbell; and a brother, Fr. Fred Maples, S.J., of Weston, Mass. In lieu of flowers, the family asks that gifts be made to the Sophia Smith Collection and College Archives at Smith College, 23 Elm Street, Northampton, Mass., 01063 or to the American Philosophical Society’s Research Grant Program in memory of Mary Dunn, 104 South Fifth Street, Philadelphia, Pa., 19106.